Substantial change is always opposed. Whenever major change to the status quo is sought, there will be winners and losers; there will be those who thrive on the change and those who fear it. Therefore there will be advocates and adversaries and those who look on from the sides. This is as true for formal organisations as it is for disparate peoples who find themselves bound together in the face of a common threat. Campaigns succeed when the balance of interests is swayed sufficiently for the decision taking authority to act in line with your campaign aim. This is most likely to occur when you succeed in winning influential audiences over to your campaign. Most campaigns focus on trying to topple their adversary. They climb inside the box and hope to slug it out with their adversary. Don't. Try instead to win influential audiences over to your point of view. Work on increasing your influence to the point that the success of your campaign is more or less a foregone conclusion long before you take on your adversary or seek the attention of the decision taking authority. Note that authorities are seldom neutral. 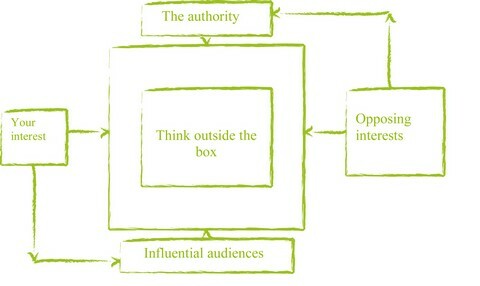 In the diagram above the opposing interest has influence within the decision taking authority. This can only be countered by drawing influential audiences on to your side of the campaign. Campaigns seek to bring about change that cannot be delivered through the normal process of business or politics. To succeed, campaigns must become high energy disruptions to the normal flow of events. Therefore they should take place within tightly structured time frames. Campaigning should be the structured expression of passion. A campaign works by one person or group infecting others with their enthusiasm and belief in a cause, (or service or a product) thereby tilting the balance of influences in its favour. Therefore, always campaign for something, even if your driving motive is to oppose something else.